Aquafacial by Aquapure is a 4 in 1 hydrofacial treatment for clearer, brighter, hydrated and younger looking skin. Aquapure is a medical CE marked 4 in 1 hydradermabrasion treatment that targets uneven skin tone, congested pores, excess oil, dehydrated skin, fine lines and wrinkles. It exfoliates, controls sebum and boosts collagen production to leave the skin clean, refreshed, brighter and plumper. 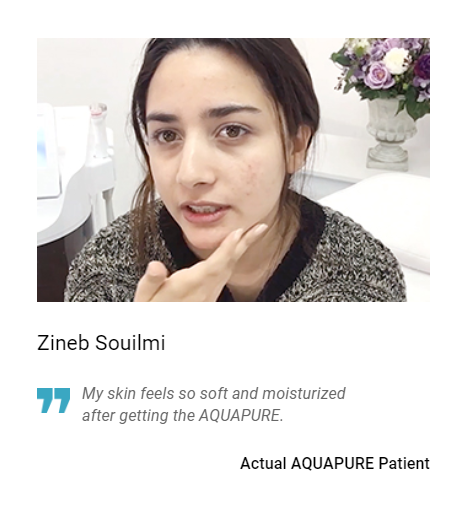 AQUAPURE is the ultimate facial platform that uses optimised user-focused technology to address a multitude of skin concerns using 4 hand-pieces and 3 patented, proven serum formulas. Aquapure is a portable device that is easy to use, providing quick and effective treatments, ideal for busy clinics. The all-in-one solution means your patients see immediate benefits with no-downtime. It starts with the removal of dead skin cells and other impurities; whilst exfoliating dead skin cells and keeping the skin clean and smooth to the touch. The next method then provides both a powerful and direct route to deeper skin layers via transdermal motion. Then comes the removal of any excess sebum & dead skin cells, whilst removing blackheads, excess oil whilst maintaining skin moisture levels. It then proceeds to increase the regeneration of elastin and collagen by regulating low electrical currents to both the skin and facial muscles. Hydrate and nourish the skin with the infusion of hyaluronic acid and antioxidant-rich ingredients. Lastly comes the hydration and nourishment of the skin by the infusion of hyaluronic acid and antioxidant-rich elements, whilst nourishing and moisturising the skin. Auto-Reaction Interface which selects the correct interface for each hand-piece, simplifying the procedure and shortening treatment time. The AQUAPEEL spray control allows for equal distribution of applied solutions at a range of 10 different levels which maximizes treatment efficiency and clinical results. AQUAPEEL: Deep Pore Cleanse exfoliates and removes impurities and nourishes the skin to leave the skin feeling fresh and hydrated. ELECTROPORATION: Conducts stable electric currents to enhance serum delivery and absorption of nutrients into the skin. MICRO-CURRENT: Stimulates blood circulation with a lifting and tightening effect that also promotes elastin and collagen regeneration. COOLING/HEATING: Cooling energy is used to reduce fine lines and wrinkles while helping to enhance skin repair. The heating energy firms and tones the skin. Consumable solutions are distributed equally and efficiently ensuring long lasting solution products. CLEANSYS - System cleaning solution for hand-pieces.